#1099 at North Freedom, September 2000. 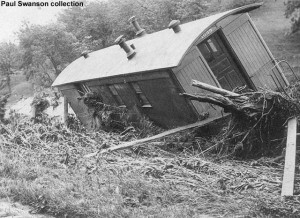 #1099 after flood wreck, June 20, 1908. 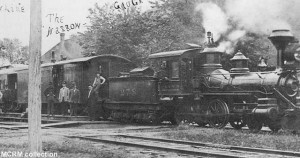 #1099 in service before 1916. 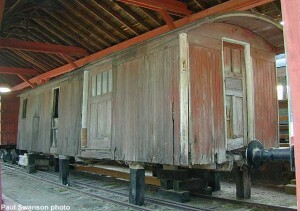 This small narrow gauge car was used in southwestern Wisconsin on the Fennimore to Woodman line of the Chicago & North Western Railway. C&NW discontinued that operation in 1926. The car was probably built in the 1870s, for the Des Moines & Minneapolis Railroad, which transferred the car to the C&NW in 1879. It is constructed of wood and is currently on display, awaiting restoration.